Ozone is a triatomic allotropic type of oxygen that is unsteady. It is available in the climate for around 20 kilometers above ocean level. It is framed from the oxygen that is present there, in the presence of ultraviolet light from the sun. Ozone is of imperative significance in shielding the world's surface from exposure to harmful ultraviolet radiations. 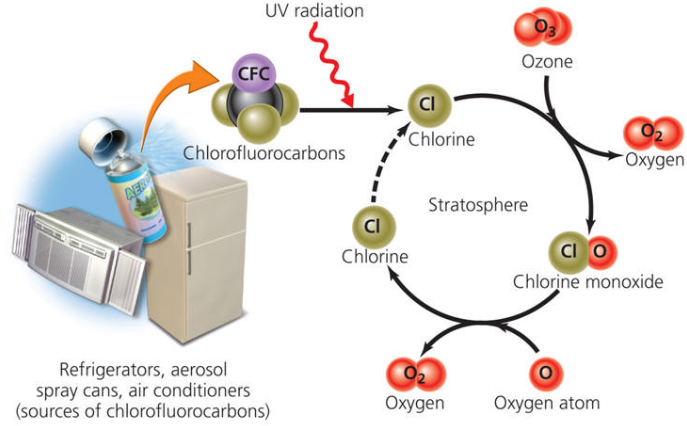 The utilization of chlorofluorocarbons in refrigerators and aerosols and their ensuing discharge into the air is responsible for making gaps in the ozone layer over the Antarctic and Arctic areas. It is expected that this will permit intemperate UV light to achieve the earth, which can bring about skin malignancy in people. 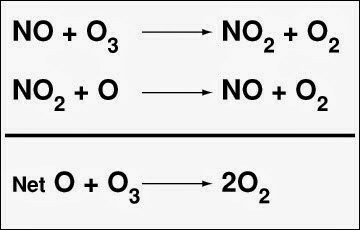 The oxides of nitrogen, specifically nitric oxide, react very rapidly with ozone to give nitrogen dioxide and oxygen. Hence, the oxides of nitrogen discharged from the fumes frameworks of supersonic fly planes gradually deplete the ozone layer. 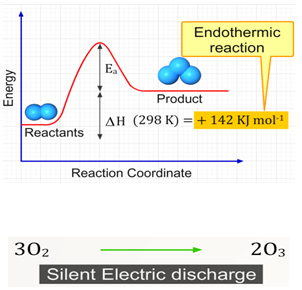 Ozone is set up by passing a silent electric discharge through dry, unadulterated, and cold oxygen in an extraordinary device called the ozoniser. This way concentration of approximately 10% of ozone can be obtained. The ozone formation is an endothermic process; it must be completed at high temperature. This is the reason; it is set up by method of silent electric discharge. If further high concentrations or pure ozone is to be prepared, it can be obtained by fractional liquefaction of an oxygen-ozone mixture. Ozone is a light blue gas with a characteristic fishy smell. At - 1200C, it condenses as a dull blue fluid, which on further cooling, gets hardened to violet dark crystals. Ozone is thermodynamically unsteady and disintegrates to oxygen. The decay is exothermic and is catalyzed by numerous materials. High concentrations of ozone are hazardously dangerous. Lead sulphide to lead sulphate. The ozone atom is symmetrical and exhibits a bond angle of about 1170. Since Ozone is unstable, it is actually a resonance hybrid of the canonical forms. Ozone is used as an antiseptic. Ozone is moreover used as a disinfectant. For Example, it is used in filtration of drinking water. It is used as a part of the produce of potassium permanganate from potassium manganate. It is moreover used as a part of the creation of manufactured camphor and artificial silk.